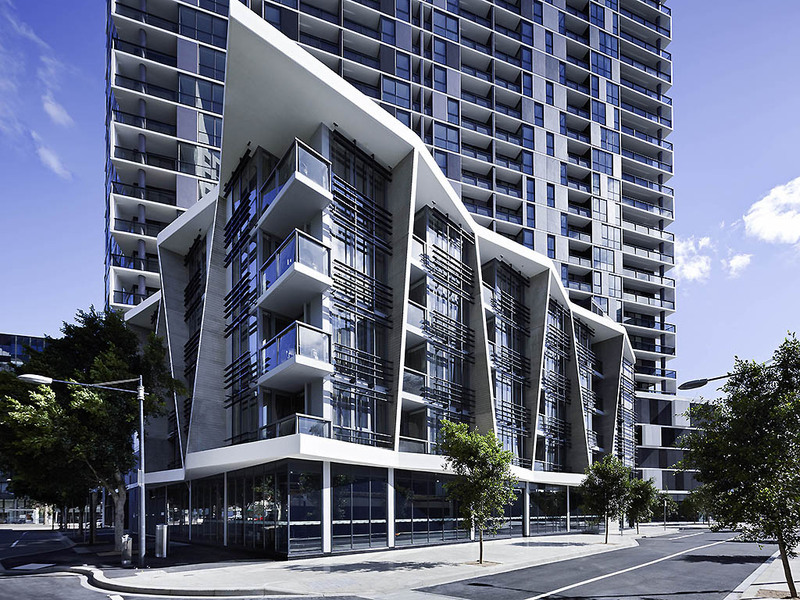 The Sebel Residences, Melbourne Docklands offers excellent service to accompany private residence-style comfort. Choose from a range of one, two- and three-bedroom apartments placed throughout nine buildings on the Docklands NewQuay Promenade. Each apartment provides a private balcony, many with stunning views of either Victoria Harbour or the Melbourne skyline. Within each building, guests enjoy dedicated secure parking, fitness centre and an indoor or outdoor pool. Offering 1, 2 or 3 bedroom apartments with spectacular city or harbour views. All apartments feature full kitchens, open plan living and dining area, private balcony, the option of 1 or 2 bathrooms, internal laundry and security intercom. Serving a unique cuisine blended with modern Australian and European influences, Capri Café & Lounge offers a warm, and inviting environment for everything from a coffee on the run to a substantial 3-course dinner. Property was just adequate, We had apartment 1215 in Marmion. Main bedroom had sheer blinds, so light would shine through all night making it hard to sleep. Gas cooktop.didnt work. After enquiring at reception, several hours later, the gas was switched on. Carpet from lift to apartment was appalling. Made it very hard to wheel luggage. Top rack of dishwasher kept collapsing as rollers seemed to be missing. No breakfast bowls, just very large noodle bowls. A bit “faulty towers”. Location was great and staff very friendly..
Good accommodation just on the edge of the city. My family had a very good stay here with a view over the water and the city. The only let down was there was a broken chair on the balcony that almost caused an injury. This was reported immediately and we were informed it would be replaced straight away. This did not occur. The cleanliness of the apartment was very good except for the balcony which was dirty and the table had dry liquid which had been spilt on it. I have sent the email on tuesday 5th March about experience I went through, but I still haven't got the reply yet. I had bad experience, Customer service was terrible, even I'm Gold member. Apartment - No aircon in the room, only in living room, so I had to sleep in living room on sofa. Stayed for 3 nights with 5 friends in a 3-bedroom apartment. The location, amenities and service absolutely exceeded our expectations, especially given the reasonable price. Location - brilliant 180 views of the waterfront plus the Melbourne Star, captivating by day and magical at night. Close to IGA, Thirsty Camel and Celebrations wine stores for self-catering. Lots of great restaurant choices along the Promenade offering a variety of cuisines, water views, and reasonable prices. Conveniently placed close to 2 free-tram stops. The tram took us to the gate of the Aust Open for free, and the tram was packed but we had seats because we got on at the start of the line (a real bonus because a few stops along, disappointed tennis fans were stuck on platforms due to the trams being full). Amenities - Not brand new, but very spacious, clean and comfortable accommodation. We were very impressed with the value for money. All beds were super comfy, bathrooms very clean, kitchen well equipped and all in working order. Good free wifi (all 6 people using it with no problems). Tennis court, indoor and outdoor pools, jacuzzi and gym all looked great, but we didn't end up using them as we spent long days at the Aust Open.Service - very attentive and friendly reception staff from check-in through to departure. Always happy and smiling. Helped us with advice on transport to AO. We pointed out that the kitchen sink wouldn't hold water because the plug wasn't a good fit. When we returned from our day's activities there was a new plug and note sitting on the kitchen bench. Amazingly prompt response.Extras - we had a delicious breakfast each morning at The Capri Cafe (part of the Hotel and Apartment complex). It was a very short walk from our apartment building. The food and service were great and we had lovely views of the waterfront. A really fun start to the day. I would definitely stay here again. With another appointment in Melbourne requiring us to stay a couple of nights we often stay at the Sebel Residences in Docklands. This time we were in the Condor apartments and the room was great. Fantastic view down Victoria Harbour and the waterfront was alive with activity. A couple of "mega yachts "in harbour for the tennis I presume added to the attraction. The room had everything needed for a relaxing retreat. We stayed for 3 nights in a one bedroom apartment. I wasn't aware that the Sebel Residences was split over several buildings in the Docklands. We were placed in an apartment in the Promenade building which was a few minutes walk from the Sebel Docklands where we checked in. The room was nice the only thing I didn't like was that there were no windows in the bedroom. I thought the bedroom would be like the photo on the website which had large bedroom windows. It was also inconvenient to walk down the road each morning to get breakfast as we had booked a bed and breakfast package. The next day I spoke to the reception about the windows and they were very helpful and we moved to an apartment in the Condor building. The Condor apartment was smelly, I had to buy an air diffuser to disguise it. The air conditioner was very noisy. One of the windows in the lounge was broken so that the window opened wide enough to climb out, we were on the 13th floor. I didn’t feel this was acceptable with a child in the room. I realise the risk was low but I would have preferred it to be zero especially when the broken window was next to the sofa and I twice caught my son standing on the sofa leaning on the broken window (it was closed at the time). I told the reception about the window and I was told it would be fixed but it wasn’t. The reception staff working the day shift were much more helpful than the evening shift. One morning when we were going to breakfast someone had urinated in the lift. I was also unhappy that a phone charger and my son’s shoes which were left in our first room were never returned. How could they have gone missing? Also the reception staff never got back to me about this even after my second enquiry when I was told they would bring them straight up to our room or I would be called back. Neither happened and I eventually came to reception to be told that they couldn’t be found. I'm really not one to complain and I can’t remember ever staying in another hotel that I felt the need to complain. I wouldn’t consider staying at the Sebel Residences when I am next in Melbourne. My wife and l decided to take our family to Melbourne, for a night away prior to Xmas. We were taking the kids to a show at the kids Theatre and as a Gold Accor member received a call the night prior asking if we had any specific requests or requirements. We are a very simple low maintenance family however did ask for an early check in if possible so we could drop our bags in our room and drop the car prior to the show. (We travel 2 hours to Melbourne) We were advised this was possible and would be ready between 12 and 1pm.We arrived the following day and on attempting to check in couldn't access our room as it had been given to another family, we were told we would be reallocated to another room and given the room number which would make it easier with the young kids as we could access the pool and facilities from within the same building rather than having to walk down the street which was the main reason we chose the Sebel rather than staying at the Sofitel as l usually do, however the room wouldn't be ready until after the show. We left our bags and headed out. On our arrival back after the show we were given yet another room allocation which meant we had to walk down the open street, to and from our room as well as to the pool not ideal with a 8,6 and 3yr old. This was obviously a change from our prior discussion with staff some of who apologized profusely and literally followed us apologizing for the stuff around.When getting to our room there was marks all over the walls, the ironing board didn't work (which l use often while travelling) there was no cloth or washing equipment to even wipe down the table or bench. Even locking the door was a mission as it doesn't lock from the inside.To top it off after all the stuff around you would think the welcome card would have the correct name on it however was still in the previous persons name, l'm assuming it was the person who originally took our room. Attention to detail obviously doesn't rate highly.Like l mentioned at the top we are simple people and don't expect too much however when paying good money ($400 plus) for a room for a night l do expect a little better than we received and based on the experience l'll be sticking with the Sofitel from now on.I also assume that staff were well aware of what went on as apart from 1 staff member who did her very best on check in to correct the error we were not asked once how our stay was etc when checking out which is unusual. Hotel was a good, rooms abit run down but still livable. The onsite Cafe is a disaster, we had breakfast paid for the whole week but decided to eat else where after the second day due to the poor service. Staff very nice and friendly, parking was good including price, room was good, this was an Accor free stay but did cost me $100 (upgrade??) again nothing for free.This will be my last ACCOR membership. Very nice property. Centrally located. Easy access to the free tram. It's nice to have the amenities of an apartment (kitchen, laundry). A few minor items were in disrepair or worn, but overall, we had a very nice stay. Great flat, great views over docklands and the Westgate Bridge. Clean and everything we needed inc washing machine and dryer. It wasn't in the *main* Sebel but we had all the amenities you would expect with an Accor hotel. The building is in a great location, the views weren't fantastic on the side of the building we were on. The apartment was still modern, but beginning to show a little bit of age. The parking situation with the small, one way roads were terrible to deal with, and the staff need to do more to help guests with this. Also only had 2 towels between 2 of us for the 2 nights, and no housekeeping. Evacuated Saturday morning. After evacuated into the Street no Fire Engines came and no staff came to let us know what was happening. After Fire Alarms stopped all of the people who had evacuated gradually started to move back to their accommodation me included. Not impressed as no one came to tell us what was happening. Loved the quality of the apartment. I really only needed a bed - but the apartment was cheaper than a standard hotel room in the Novotel/Mercure where I usually stay. Perfect for my work function.Parking is a bit tight in the garage.Docklands is dead after 9pm during the week. If you want to go to the CBD - it's a good walk.. In general, this was a great experience. I had stayed at the property a few years ago before it changed its name. There is still some construction around the hotel, but nothing like before....so what did I like: The price was amazing and for 1dollar more, a cooked breakfast was included! On the day before I arrived, I received a phone call from the assistant manager asking me if there was anyway in which the hotel could help. She arranged for my son to park free for a several hours as he was joining me for dinner. On arrival the same person checked me in and I felt provide a high level of personal service. I liked the room which is really set up for someone to stay for a few days and self cater. My only complaint was that I did not get a wake up call even though I had booked it. I would definitely recommend it. Great apartment, the best view of Melbourne Docklands! Fantastic! Reception staff were outstanding, even packed our perishable items in the fridge. Nothing was an effort. The complimentary upgrade was greatly appreciated. The 3 bedroom apartment was very clean with plenty of toiletries and towels. Breakfast a la carte, was amazing! Overall stay was very good, but began with car parking confusion about the equipment and procedure needed to enter garage and park my car. Took over 1 hour and much car shuffling to get my car securely parked on arrival night, then further car shuffling and collection of remote equipment the next morning. My original booking prior to arrival requested secure undercover parking. Finally resolved the issue, but most reception staff had no knowledge of what was needed to access my assigned car park. Most of the instructions provided by staff were incorrect, much to our frustration and inconvenience. When car park was resolved the next morning, everything ran smoothly and it was a very pleasant stay. check in was terrible- did not want to honor the current promotion of $1 Breakfast. claimed the offer had finished even though it is available on the website. Tried to order Room Service at 8.45pm as advertised through to 9.00pm but reception or restaurant would not answer. Finally got through to reception at 9.15pm and they said restaurant was close. No dinner for me that night! I had a lovely stay here at the Accor Hotel with my family and wife’s parents. It was very clean and well prepared for our stay. The staff were exceptional and I would 100% reccomend this to future customers, family and friends!